FORT WORTH, Texas (AP) — The teenager who used an "affluenza" defense in a fatal drunken-driving wreck was booked into a Texas juvenile detention center following his deportation from Mexico on Thursday, more than a month after he and his mother fled the U.S. as prosecutors investigated whether he had violated his probation. Ethan Couch, 18, arrived at Dallas-Fort Worth International Airport late Thursday morning and could be seen walking through the airport escorted by law enforcement. Couch and his mother were apprehended in the Mexican resort city of Puerto Vallarta on Dec. 28, after a call for pizza delivery tipped off authorities to their whereabouts. Couch initially fought deportation, but he dropped the fight this week. His mother was deported last month. "We've reached a great milestone," Tarrant County Sheriff Dee Anderson said outside the juvenile facility in Fort Worth. "This is a day we've looked forward to, when we have them both here and back under the jurisdiction here. We're hoping that the day comes for justice for the families and the four victims that were killed." Couch is scheduled for a court hearing Friday where a judge could decide to move him to an adult jail, which Anderson said he would support given the severity of Couch's offenses. Couch also faces a hearing on Feb. 19 to determine whether his case will be transferred to the adult system, where he could face more time behind bars. "He's certainly capable of understanding now what's going on, and I'd feel better if he was there (in an adult jail)," Anderson said. Authorities believe Couch and his mother fled Texas in her pickup truck in early December, after an online video appeared to show Couch at a party where people were drinking. Couch was sentenced in juvenile court to 10 years of probation for the 2013 wreck that killed four people and injured several others. The terms prohibit him from drinking or leaving Tarrant County, Texas. Couch's attorneys Scott Brown and Reagan Wynn said in a statement Thursday they are "optimistic" their client will complete his probation term without any further issues. They also predicted the judge would keep Couch in juvenile custody at least until the hearing next month. During the trial in the juvenile case, a defense witness argued the then-16-year-old Couch had been coddled into a sense of irresponsibility by his wealthy parents. The expert deemed the condition "affluenza," which isn't recognized as a medical diagnosis by the American Psychiatric Association and drew widespread derision. Couch's mother, Tonya Couch, is charged in Texas with hindering the apprehension of a felon. She was released on bond this month after being fitted with an electronic ankle GPS monitor. According to an arrest warrant, she told her estranged husband, Fred Couch, that he would never see her or their son again before fleeing. 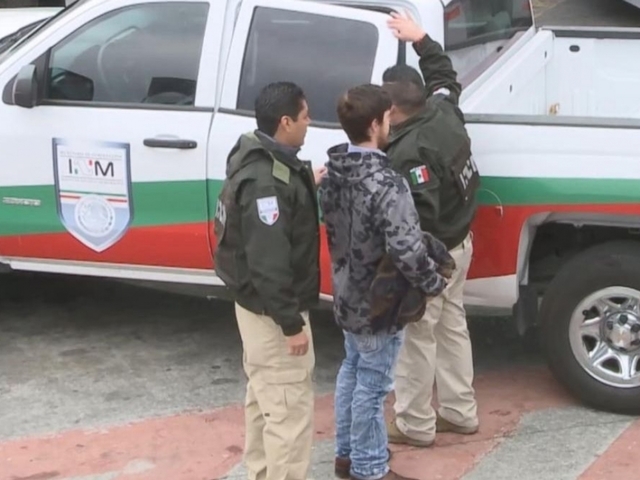 Mexican immigration agents put Ethan Couch on a Texas-bound commercial flight in Mexico City early Thursday. Video released by Mexican immigration officials showed Couch wearing a bluish camouflage-print hoodie as he was escorted out of the detention center and onto the plane by four agents. If the case is moved out of the juvenile system, the judge could order Ethan Couch to spend up to 120 days in jail and then finish the remainder of his 10-year probation as part of an adult sentence, according to Tarrant County District Attorney spokeswoman Samantha Jordan. If he violates probation during that time, he could get up to 10 years in prison for each of the four people killed in the drunken-driving wreck. If the case remains in the juvenile system, Ethan Couch could be held in a juvenile detention center for violating his probation until he turns 19 in April, at which point he would become eligible for parole, Jordan said.